The ajax event OnClick is executed when the field that it’s based on is clicked. Choose a field to create an event To define in which field the event will be add to. 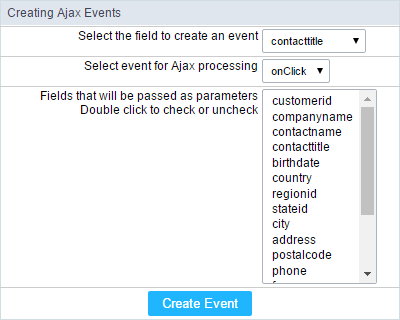 Choose an event that run the ajax Defines which event will be added to the field. The ajax event OnChange is executed when the value of the field that it’s based on is modified. The ajax event OnBlur is executed when the focus is removed from the field that event is based on. The ajax event OnFocus is executed when the field that it’s based on is applied with a focus.